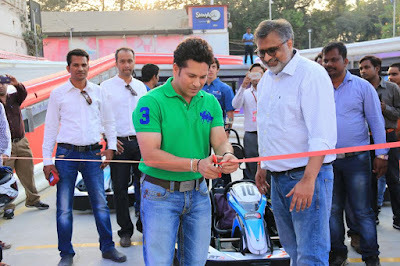 Mumbai, March 17, 2016: Master Blaster Sachin Tendulkar inaugurated Sky Karting, the all new Championship Karting at Smaaash, Lower Parel. Motorsport enthusiasts from the island city of Mumbai and around will now be elated to have an all new world class go-karting track in the city hub of Kamala Mills in Lower Parel. Smaaash, India’s first entertainment and gaming zone will offer a 430 meter multilevel track, which is the most advanced and the most safe karting facility in India. This track is easy to maneuver for beginners, and at the same time challenging for those who would want to go flat out. If you are looking for some adrenaline rush, this is the go to place for you! Smaaash presents the latest technology of 15 electric karts for adults and 10 for kids by Sodi Karts in Nantes, France, who are the only renowned manufacturers of electric karts, powered by Lithium Ion batteries. The spring barriers on the other hand are nominated as the best technology for safety levels on track for drivers and karts. The barriers are such that when a kart comes in contact with it, the spring technology based barrier absorbs the impact and gently pushes the kart back on the track, ready to continue the thrill. Thus, no matter how adventurous you are, Smaaash will assure complete guaranteed safety like no other track in India. Another interesting feature is the advanced lap-timing feature that keeps you updated on every bit of excitement, along with the track view feature that will provide one with live coverage on racing. Brain child of the multi-faceted Mr. Shripal Morakhia, Smaaash offers a lot more than your run-of-the-mill banquet hall and gaming center. With current presence in Mumbai, Gurgaon, Hyderabad and Bangalore, Smaaash presents an unmatched range of games that offer a superlative virtual-reality experience, and combines the best of sports, music and dining into a highly immersive, interactive, innovative and involved entertainment experience. Smaaash has not only redefined sports entertainment, but also raised the bar for customer engagement. This innovative entertainment and active engagement is what defines Smaaash.